Twitter++ is a tweaked version of the official Twitter app for iOS which improves on various features and integration with other popular apps. The tweaked app is not available on the App Store, and in order to install it, usually you would need to jailbreak your iPhone or iPad. But in this article, we’ll explore how to install Twitter++ on a non-jailbroken iPhone or iPad. 3 Is Twitter++ safe to install? Build Store is a third party app store that enables you to install apps from outside the App Store without having to jailbreak your iOS device. Twitter++ is available on the Build Store, and so, you can install it from here directly on your non-jailbroken iOS device, without using a computer. Build Store uses a paid subscription-based model, and costs $9.99 per year per device. To know more about BuildStore, check out this article. Once you install Twitter++ on your iPhone or iPad, you’ll unlock the following additional features within the app. Share Content: Share links and media from Twitter via iOS Share Menu by long pressing on them. 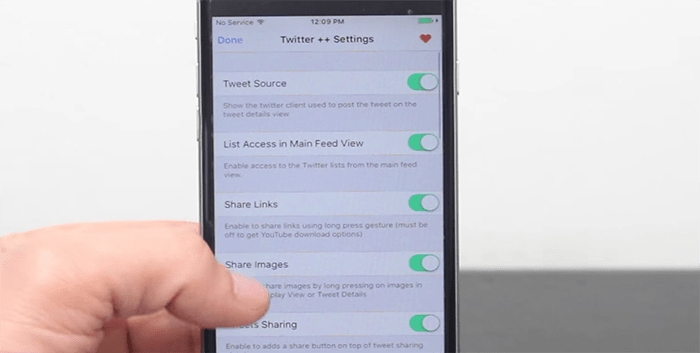 Share Tweets: Directly share tweets externally to other apps. Save/Share Media: You can easily share media (images, video, Vines and GIFs) from Twitter, or save them locally to your iOS device. Direct Message Share: Share direct messages from Twitter via the iOS Share Menu. YouTube integration: Open YouTube links in Twitter’s built-in video player or the official YouTube app. Instagram integration: Open Instagram links in Twitter’s media service or the official Instagram app. Web browser Integration: Open Twitter links in third party web browsers. Show Keyboard on Compose: Now the keyboard won’t show up on the media screen by default. Instead, it will only show up when you compose a post. Automatic Long Tweet Creation: Twitter++ allows tweets over 140 characters by automatically converting them to images or use Pastebin to post tweets. Easy List Access: You can now organize your Twitter feed with the help of lists. Confirm Favorite: Twitter++ prompts for confirmation when you favorite a tweet. Hide Follow in Tweet: Remove the Follow button on tweets. Remove Status Bar: Enable full screen view for Twitter by hiding the top status bar. Timeline Badges: Show verified batches for users in the timeline. Note: Installing an updated version of Twitter from the App Store may overwrite the tweaked version; hence, you may lose all the tweaked features provided in Twitter++. Disclaimer: The article is only intended as a knowledge base for installing Twitter++ on non jailbroken iOS devices. 7labs may not be held responsible for any violation of the terms and conditions, as laid out by the original app developers.